Galley Properties are delighted to offer to the market this beautifully presented, one bedroom apartment. Situated on a leafy section of Jossey Lane, this desirable location is less than ten minutes drive from both Doncaster town centre, and the A1(M) and motorway networks. Tucked up against a patch of woodland on the edge of open farmland, Olympia Court is a stylish development of quality apartments with the latest in security features and off-street parking. An all-electric building, it offers comfortable, modern accommodation for the professional couple or individual. ENTRANCE HALL Bright and welcoming, the entrance hall has doors off to each room of the apartment, plus a very useful storage cupboard. Featuring a video intercom system for extra security. LOUNGE 16′ 4" x 14′ 6" (4.98m x 4.42m) This wonderful, open-plan space is a sunny, cheerful room. The south facing window lets in tons of light and the pale walls really lift the space. Wooden flooring, white skirting boards and white interior doors all add to the impression of light and space. There’s an electric radiator under the white uPVC double glazed window, power sockets, a tv aerial point and a central ceiling pendant light. KITCHEN 9′ 6" x 9′ 1" (2.9m x 2.77m) Cream, gloss fronted cabinets and drawers pair with the beech wood finished counter tops to offer a clean, modern kitchen. A mosaic tiled splash back in creams and browns ties all the colours in together. There’s an electric oven and induction hob under a stainless steel extractor fan, and a one-and-a-half bowl stainless steel sink. With plumbing for a washing machine or dishwasher and a tidy spot for a fridge-freezer, this kitchen is nicely designed and a pleasure to cook in. A stylish breakfast bar makes a natural divider between the kitchen and living room areas and there’s space for at least three bar stools. Recessed spotlights provide ample illumination and there’s another radiator here too. BEDROOM 13′ 9" x 10′ 8" (4.19m x 3.25m) Beautifully decorated in cool blues and greys, the bedroom is a lovely restful room and the south-facing uPVC window catches the best of the afternoon sunshine. 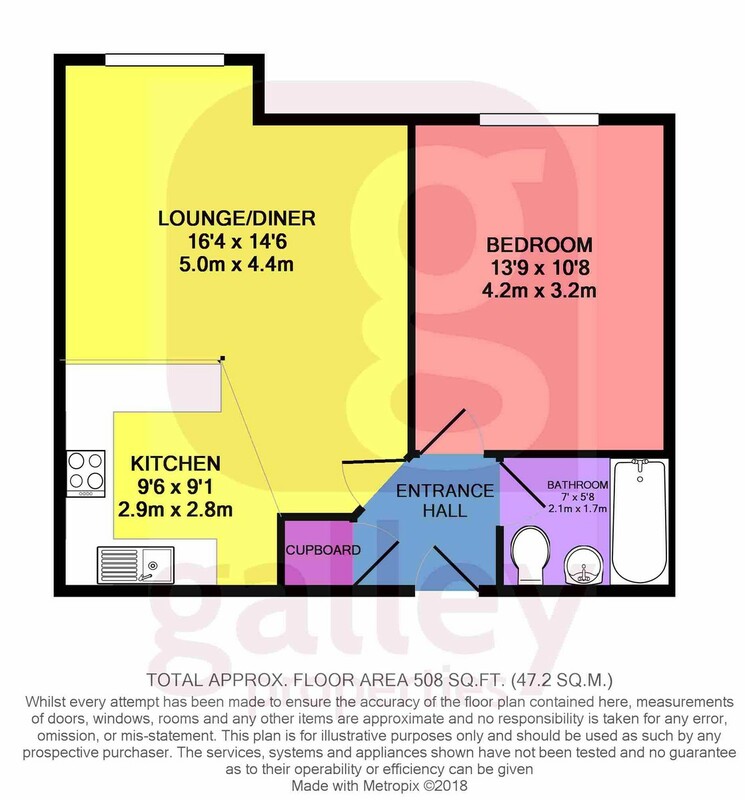 Fully carpeted, complete with radiator, power points and a central ceiling light, gorgeous space has ample room for a double bed and bedroom furniture too. BATHROOM 7′ 0" x 5′ 8" (2.13m x 1.73m) Tiled floor to ceiling in cream, the cream bathroom suite comprises a full size bath with power shower and glass shower screen, a built-in WC and pedestal sink. There’s a towel radiator, too, and recessed spotlighting. OUTSIDE The apartment comes with its own designated parking space as well as private garden to the front of the property and there’s a communal garden area too. Access to the building is through a secure door with video intercom system.